Jammer's Blog » Why does Robert Zemeckis hate live action? Why does Robert Zemeckis hate live action? 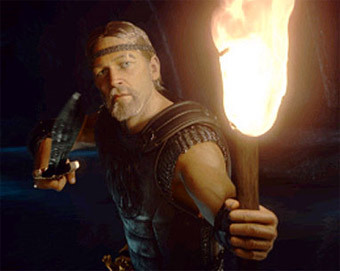 “Ray Winstone” in Robert Zemeckis’ Beowulf. Performance capture technology turned Winstone from Average Joe into ripped superhero. Back in the day — a long, long time ago — Robert Zemeckis was best known for directing Back to the Future and its eventual sequels. He probably became a big mainstream name with the massive success of Forrest Gump. That movie also perhaps signaled the beginning of the end for Zemeckis as a traditional live-action filmmaker (although one could argue that moment was earlier signaled by his helming of the then-groundbreaking animation-combined-with-live-action Who Framed Roger Rabbit?). With Forrest Gump, Zemeckis played with the notion of compositing live action with archival footage, allowing Tom Hanks to appear in the same shots as TV footage of President Nixon, among plenty of others. It was a gimmick that Zemeckis later employed in Contact, in order to merge the movie with footage of President Clinton in press conferences. If you watch the special features on the Contact DVD (or maybe it was the VHS tape, to be honest), you see that Zemeckis’ penchant for tweaking existing images began in earnest with that film: He found that when the skies in particular outdoor shots weren’t “interesting” enough, he could replace them with skies that had better-looking clouds. I think it was this sort of “because I can” mentality that guided Zemeckis’ career into the 2000s. But since Cast Away, it seems Zemeckis has become a director of purely “performance capture” 3D CGI animated fare. His last three releases: The Polar Express, Beowulf, and now A Christmas Carol. All animated, based on performances by real actors. Don’t get me wrong: I’m not criticizing Zemeckis for his choices. I am simply observing the course of Zemeckis from a traditional filmmaker with a penchant for visual effects to a full-blown technology-driven Animation Guy. I suppose everyone has their niche (or pigeonhole). With Michael Bay, it’s CGI for the purpose of sledgehammering you in the face with testosterone-driven action mayhem. With Roland Emmerich, it’s CGI for the purpose of ending the world as seen from the point of view of dysfunctional families and government bodies. With Tim Burton, it’s quirky animated fare or offbeat projects starring Johnny Depp. Will Zemeckis ever make a live-action movie again? One wonders. Interesting observation. I find the B horror filmmaker to big budget fantasy filmmaker to be a strange transition as well. See Peter Jackson and Sam Raimi. It’s too bad. The motion-capture films are okay – I enjoyed but didn’t get much out of Beowulf and have only seen parts of The Polar Express, which looked genuinely creepy. But I really miss Zemeckis’ live-action films. Contact remains one of my favourite movies and it’s a whole lot more satisfying to watch real actors on real sets or in real locations. The CGI films don’t have much depth or heart. I doubt anyone will watch them again in ten years or more; Back to the Future they are not. I suspect ‘Polar Express’ was a case of the technology not /quite/ being up to what the film maker’s were trying to force it to do. It had a very odd look. I suspect you could try something similar today and it’d come off much better. Zemeckis is one of my favorite directors. It must be tempting for a lot of film maker’s to play with all the new, rather boundless capabilities of CGI. Like kids in a candy store, allowed to let their imaginations run wild and actually do all the things the could never have thought to attempt even five years ago. I can understand the fun of indulging that. “Forrest Gump” will always be > than “A Christmas Carol,” however. I have no idea if he will ever make a live action movie again but in a way, it’s good to have a Director out there, like Cameron, that is constantly looking to push the medium forward. Zemeckis is behind some amazing movies, he really is 2nd only to Speilberg IMO. Long may he continue to push things to the limit. Review the Plan Jammer! I need to have my distaste validated. Don’t tell me you are waiting for it on TV. Interesting, I like CGI when used appropriately and seamlessly, but CGI seemingly just for the sake of it or as an easy out is overused. Take the Lord of the Rings movies for example, so little CGI used compared to what you would expect, they hand crafted so much of the sets and used a good mix of models, CGI and full-sized sets, taking the best of all worlds and combining them. And again speaking of those movies, they went back through and edited the colors/lighting/etc. in every scene similar to the talk about Zemeckis changing the sky. It really is amazing just in general what they can do. And as for the comments about Polar Express and the technology being too far behind, I disagree strongly. Check out “Final Fantasy: The Spirits Within” to see how lifelike they can make people/living things look in pure CGI. It’s so lifelike that it is jarring to hear the voices of various famous actors/actresses coming from “people” that look nothing like them. For Polar Express, I think the look was either a conscious choice and/or them being too cheap to make it look as good as it could have. Actually, it gets worse the more lifelike looking the CGI dolls get. Google the term Uncanny Valley. That’s why the scaled back the realism and details for Fiona in the movie Shrek. Zemekis has taken a wrong turn into the Uncanny Valley years ago and doesn’t seem to notice. After Forrest Gump but before Contact, Zemeckis employed CGI/live action compositing with an episode of HBO’s Tales from the Crypt, in which he used images of Humphrey Bogart. The episode, and for that matter, the Bogart effects, were awful. I don’t know about an eventual return to live-action, but it’s confirmed he already brought back the screenwriters from the original Roger Rabbit film, ready to start a sequel to the old 1988 noir classic. Personally, I think these films have been improving. Polar Express was step one, Beowulf was quite leap, and Christmas Carol took another one as well. CGI is still an evolving technology. Some movies end up looking dated faster, but I think it works, as long as the story is involving. It worked for the Star Wars films. It even worked on the Star Trek TNG films. Generations was the first film to push the CGI envelope, through the Enterprise models and the Nexus effects. First Contact and Insurrection went even further. It even affected Voyager and DS9, midway through their run. You couldn’t do a Jem’Hadar/Cardassian fleet swarming DS9 at the end of season 5 in any other way. You can only do so much with practical visual effects. CGI is necessary, both in terms of visual sequences and cost issues. Something that also comes to mind is the way CGI was introduced in the movie world. I grew up in the 1980’s, when movies still relied on practical effects and puppets to create fantasy worlds (Labyrinth and Goonies are two of my personal favorites). Then Jurassic Park arrived in 1993. The minute I saw a living breathing dinosaur rendered by CGI towering over Sam Neill and Laura Dern, filling a 30-foot screen, it was like a new world opening before my very eyes. John Williams’s score helped to fill that sense of wonder. I’ll never forget that first time. Can’t say I share the same opinion about Final Fantasy; I thought that was already a dreadful story that no amount of CGI could possibly save; videogame movie adaptations DO NOT WORK. I don’t know if Zemeckis plans to return to live-action, but I won’t blame him if he sticks to animation. It works for him, the way it often works for Tim Burton. Polar Express is definitely in Uncanny Valley territory. However if you can get used to the kid’s creepy expressions it’s a pretty good story. Contact was one of the first DVDs I ever bought and the one that got me hooked on commentaries. Listening to Zemeckis and the special effects guy talk about the different shots was fascinating. CGI either creates the reality (a la Jurassic Park) or it should be non-obvious. Contact had a lot of shots of the non-obvious type. One I thought was interesting was a scene in which the young girl playing Jody Foster as a child is talking on a ham radio. According to the commentary she’s on a sound stage in Los Angeles. The camera pulls back out through a window and though we can still see her we can also see the exterior of the house which is somewhere like Connecticut. That’s a neat effect and one I wouldn’t have noticed or thought about. Then you have other shots such as the skies that Jammer mentioned. Some of the scenes in Contact were filmed at the Arecibo radio telescope in Costa Rica. The dish at Arecibo is quite weathered and has a “dirty” look. Zemeckis had the special effects guys clean it up and (if memory serves) it’s pretty white in the movie. To me that smacks of trying to make things a little too perfect. Perhaps then movies like Beowulf and A Christmas Carol are a natural progression for someone like Zemeckis. I mean if someone points a camera at a beautiful blue sky in New Mexico and says “Let’s try and make that look better” then 100% CGI gives them the opportunity to attain perfection in their medium. Precious data. Fortunate everyone I ran across your website inadvertently, that i’m pleasantly surprised why that coincidence didn’t occurred beforehand! I personally saved the idea.